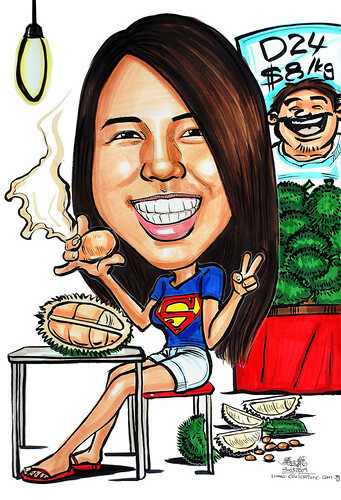 "Background : Her sitting at a typical durian stall (like those roadside geylang stall type, with those stacks & stacks of durian) smiling away after finishing a mountain of durians lying by the side and ready to eat more. If possible i would like you to draw her wearing a superman logo navy blue color Tee shirt, white shorts & red slippers. This friend of mine really love durians u see"
Durian - most Asians favourite (She is one of them for sure), but may not appeal to others, because of the strong smell.